The new Ford Fiesta ST Performance Edition arrives this Fall 2019 with lighter wheels & tuned supension. But the special edition Fiesta is a UK-only offering. 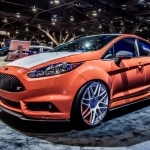 This feature Ford Fiesta ST Performance Edition appeared first on TractionLife.com by News Editor.